New Business Div., Fukuoka Office, Taisei Engineering Co., Ltd.
Understanding of the potential of three-dimensional virtual reality (3D VR) has been spreading steadily. At the same time, there is a tendency among those including enterprising researchers and engineers to work on enhancing its merit from their own original views. This issue picks up one of these cases. We focus on New Business Div., Fukuoka Office, Taisei Engineering Co., Ltd. Taisei Engineering Co. is a construction consulting company that mainly provides services such as construction management and design of expressways. Based in Fukuoka, the New Business Division provides high-value-added services in cooperation with other divisions, getting various advanced technologies into full use. The Division renders a wide range of services. Above all, their positive action towards utilization of 3D VR and its advancement can be placed as its great characteristics. Paying attention to its potential of VR from an early period, they have lead VR into a range of solutions through its effective use. In 2003, they quickly adopted "UC-win/Road", a 3D real-time VR software product just released by FORUM8. They continued to upgrade to the new version of the software as well as to expand the related software and systems. In addition, aiming to reinforce the functions of their own, they introduced “UC-win/Road SDK", a kit for development that allows the user to create applications and options for UC-win/Road, in 2009. We interviewed Mr. Noboru Hiroshige, Specialist, New Business Div., Fukuoka Office, Taisei Engineering Co., Ltd. He has been deeply involved with using VR in general in the company, examination of introduction of UC-win/Road and UC-win/Road SDK and the decision for them, as well as their use afterwards. Taisei Engineering Co., Ltd. was founded in 1971. Since then, it has been working on construction, investigation, and design of expressways and highways in Japan under the authority of the former Japan Highway Public Corporation(currently East Nippon Expressway Company Limited (NEXCO-East), NEXCO-Central, and NEXCO-West) and Ministry of Land, Infrastructure and Transport (MLIT). Presently, its head office is located in Shinjuku city, Tokyo. It also has 3 branch offices in Sendai, Nagoya, and Osaka; 2 offices in Fuchu, and Fukuoka; and 7 business offices in Nigata, Saitama, Yokohama, Chiba, Nagasaki, Oita, and Okinawa. About 130 employees are stationed at each post. There are four major divisions that drive construction consultant services of the company. Among these, Construction Management Div. deals with clients' needs appropriately under the on-site full support system. Design Div., which covers investigation, planning, and design, has been committed to maintenance in recent years. Buried Cultural Properties Investigation Div. boasts advanced excavation technology and ample experiences. Established most recently in 2005, New Business Div. was renamed from the former Environmental Sanitation Office. Focusing on the needs of the times with advanced technologies as a basis, the efforts of the Div. 's range from coating and cleaning accompanied with construction, to development and dissemination of new construction methods for soil excavation and transfer. New Business Div of Fukuoka Office featured here plays its unique role by cooperating with other divisions especially through placing weight on 3D VR technologies and supporting each task. As their methodology, they make free use of diverse software programs such as 3D modeling and 2D/3D CAD, creating simulation and making presentations with UC-win/Road. That is, they create accurate 3D VR works in the shortest time possible. They intend to supply them so that the clients can utilize effectively for comparison and examination regarding issues such as safety countermeasures, environmental matters, and landscape, or through local consultation. Mr. Noboru Hiroshige has been greatly involved with the process of introducing VR technologies in the Company. He was placed in Construction Management Div. right after joining the Company, where he really realized how difficult it was to understand the completed image only with a floor plan, a profile, and a cross section. On the other hand, partly because he had studied 3D surveying as a student, he thought of a possibility of finding a solution by 3D drawing, according to him. "It is still difficult to grasp the image or size even after explaining with a color-coded drawing. For this reason, I first hit upon an idea of expressing it in three dimensions." Subsequently, when he was move to design department, an effort started towards building CALS/EC (Public Works Support Integrated Information System) led by MLIT (the Ministry of Construction at that time). Taking this opportunity, electronization of drawings and 3D processing were promoted rapidly in the Company. In parallel, it was started to introduce VR through design tasks. Under these circumstances, when outsourcing creation of 2D perspective drawings, the person on the other side mentioned advantages of creating them in 3D. 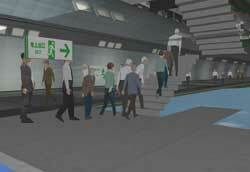 It was assumed that they could make a model with 3D modeling software and represent it dynamically by setting a path. However, there were some problems with the software used at that time, such that it took too much time to create the rendering although its expression was excellent. Therefore, they kept on trial and error work for its realization. Just when he was about to select a new tool for VR, a sales personnel of FORUM8 visited the Company by chance for showing UC-win/Road. "I thought that we could effectively create and express something that is easy to understand at a glance on the spot, assuming that it would be used in road design. So we readily decided (to adopt it)." Mr. Noboru Hiroshige mentions the reasons for reaching such determination as follows: 1) its excellent functions as a tool for consensus building such as being able to set various viewpoints at one's option, 2) it makes it possible to create road elements smoothly and easily, which were difficult with other software products, 3) an enriched lineup of tools such as models required for road design, 4) the reasonable price of the software itself. However, when the company introduced UC-win/Road (in about 2003), there were few examples of using VR in this field. Consequently, it remained in the position to be used as a supplementary tool to support design divisions or construction sites for some time so that it would be led to future use, as he looks back. 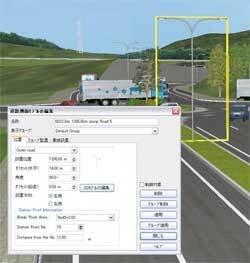 Having used UC-win/Road for three to five years though, with the Landscape Law enacted in 2004, they became to use it for more advanced purposes such as comparison and examination of landscape, or checking visibility in 4D environment with a temporal axis. Moreover, the perception of its use has steadily been spreading among clients for the last two or three years; for example, they incorporate 3D VR in design task of a proposal style. In the meantime, he moved from Design Div. to the above-mentioned Environmental Sanitation Office and to current New Business Div, promoting more advanced uses of UC-win/Road. "As a matter of fact, application methods of VR are changing rapidly," he says. In other words, aside from examination of landscape or comparison and examination as a matter of course, he pays attentions to quickly advancing purposes; e.g. examination of rezoning; checking safety performance for a dynamic field of vision. On the other hand, he says they also focus on consideration of the movement or reflected light of the sun per month, day, and hour; and analysis combined with noise problem. 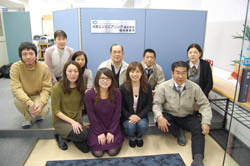 Staff from Fukuoka Office, Taisei Engineering Co., Ltd. (Front right) Mr. Noboru Hiroshige, Specialist, New Business Div. The second prize at the 3rd 3D VR Contest in 2004 "Simulation of additional work for JCT and a toll booth at a ramp on an expressway"
Honorable Judge's Award (Design Award), the 7th 3D VR Contest in 2008 "Evacuation simulation case for an aging society using 3D VR"
Mr. Noboru Hiroshige used to think that a program was something that a specialist would create, and that a user could not deal with it by him or herself. Further, he recognized that UC-win/Road was thoughtfully equipped with functions necessary for road design. However, he came up with some ideas that "I wish I could do such a thing..." through keeping on using it, about which he discussed with a sales personnel of FORUM8. He knew that SDK would make it possible to develop options to satisfy such needs. It was when he and colleagues were working on a project of Ken-O Expressway (Ebina JCT - Ebina IC section), which was opened to traffic on February 27 this year, and the other one of the Second Keihan Highway (Kadoma JCT - Hirakatahigashi IC section), which was opened to traffic on March 20 this year. For the former, they created VR for comparison and examination of safety countermeasures such as signs for warning drivers for newly constructed routes along with opening on Tomei Expressway (up and down lanes) and a section between Atsugi IC - Ebina IC of Ken-O Expressway. Then they created drive simulation (DS) for the opened sections of the above routes for educational support. Especially the DS was utilized for the event that gathered 16,000 participants including local residents, and is open to public on the Web site of NEXCO-Central Japan. Also for the latter, they produced VR for comparison and examination inside the client (NEXCO-West) in relations to safety measures, environment, and landscape. The products are also made most of as materials for explaining to local people. For both projects, the final plan was decided using a checking function of dynamic visibility incorporated in UC-win/Road. 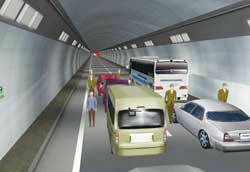 At that time, the client requested to create DS for the project of Ken-O Expressway. In response to this request, the Company introduced UC-win/Road SDK. Mr. Hiroshige and others developed and set original functions such as of scenario as they studied how to use it. Its merit was utilized in creating VR and DS for the two projects advanced nearly in parallel. He says they were able to incorporate effective functions in a short time. "When it comes to upgrading software, it usually means fixing bugs or the equivalent. In the case of UC-win/Road, however, there is a great advancement in various aspects." Mr. Noboru Hiroshige especially evaluates that the recent ver. 4 has made a substantial improvement in representation of lighting and night expression, focusing on its effect in checking visibility and so on. He also shows their prospect that the range of using UC-win/Road will be widened by introducing SDK together. He says that they are planning to add routes and speeds on driving with using these tools freely in the future, leading them into quantification of comparison and examination for different road elements. However, there are some challenges that cannot be solved on their own, such as extracting sample data and linking with analysis software, in addition to the limitations on the hardware of DS, as he says. Besides, it is assumed that the monitor is required to support 3D in aiming to improve visibility verification. These issues, however, have implications with costs; so he says that they are going to study how to make a highly value-added proposal to balance the costs. On the other hand, in response to the requests from Mr. Hiroshige and others who actually used SDK, FORUM8 is preparing for publishing a guide for SDK users in coming fall.